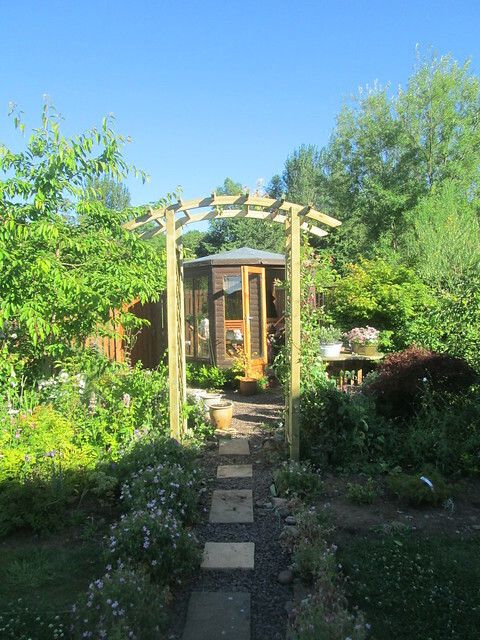 I think it was the end of May when Storm Hector raged through large parts of Scotland and flattened the more delicate plants in my garden, it also destroyed the thin metal arch that we had straddling the garden path, so we decided to replace it with a more robust wooden one. The wooden posts were stuck into long metal spikes and holes were dug by Jack and Davy our brother-in-law and Davy mixed the concrete. It seems good and solid. The photo above is of Jack doing some fine tuning. The photo below was taken a bit later when the evening sun had moved around to the front of the house. I ended up cutting back completely the everlasting sweetpea which had been covering the metal arch. It had become too fankled (tangled) to train it over the new arch and to be honest I’m not sure if I want it there now as it seems to be a bit of a bully and the stalks and leaves are very course. There are a couple of climbing roses and a honeysuckle at the arch now and I think that will be enough. A week or so of decent weather makes all the difference especially after such a slow start to the growing season as the one we had this year was. The pink rose was one of my birthday plants, I think it’s called Awakening and although all of its original blooms have gone it’s now happily producing a second flush. There’s a handy piece of ground behind the shed and that’s where I’ve been storing all of the turf that I’ve been cutting up ever since we moved here over four years ago now (I can hardly believe it’s that long). I realised that foxgloves had seeded themslves on top of the turf and attempts to move them to a more scenic location culminated in the death of a few of them as the roots were too firmly embedded – so I just left the rest of them to get on with it. They’re very happy there. I took the photo below from the top of the ladders, as you can see that bed to the left of the wooden arch is becoming quite congested, but everything seems to be growing well for the moment. I might have to move some things next year though. 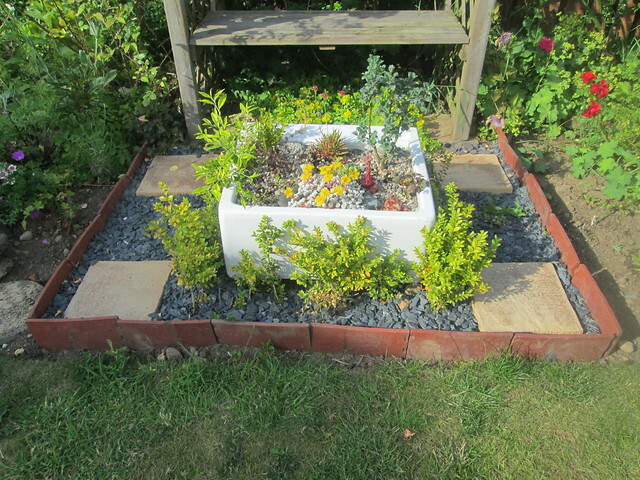 The other garden project that I’ve completed this year is the area around the old sink planter. The old rosemary tiles that I’ve used as edgers are doing the job I wanted them to and stopping the grass from encroaching into the slate. Of course the garden looks quite different now as it didn’t rain for weeks and weeks after I took these photos. The grass turned yellow, but the clover stayed nice and green and as usual was very popular with the bees. Most of the plants have coped well with our unusually hot and dry weather but I hadn’t realised that the down side to hot dry summers is that the flowers don’t last nearly as long as they do when the weather is cooler. Not that I’m complaining – well I might be – just a wee bit! 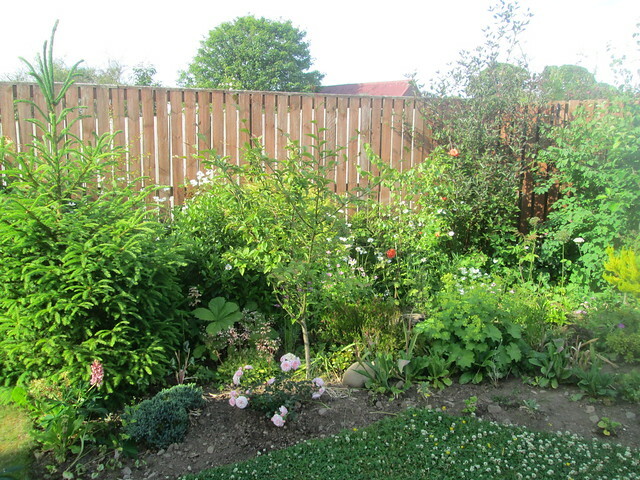 This entry was posted in Gardening, Personal and tagged Gardening, my garden in Fife by Katrina. Bookmark the permalink. I always like Foxgloves, they remind me of fairy stories and secret shady places. If they’ve gone to seed you should have them forever. Great work with the archway: I hope you both have the leisure to spend in the garden contemplating its lovely plantings. I always think that the description ‘robust’ where plants are concerned means in reality ‘thug’. I suspect I’m going to be haunted by that everlasting sweet pea. Personally speaking, I think your garden deserves awards. I simply can’t believe the transformation(s) you have made over a few years. I just gaze in wonder and enjoy the photos so very much. My favorite pic, though, must be the one of Jack hanging high? It is he, isn’t it?? I will be back to visit again. Thanks. 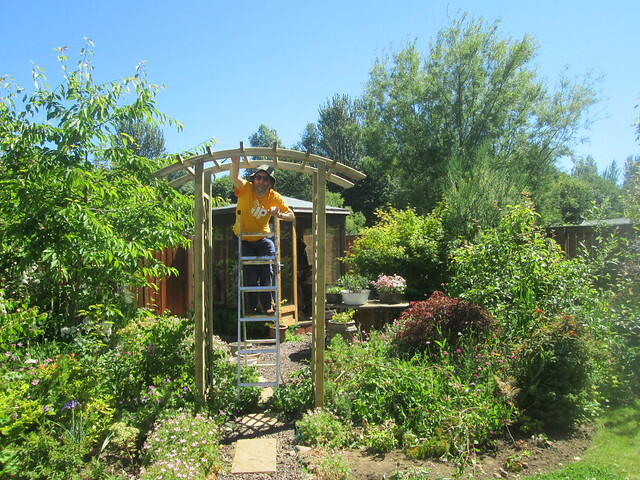 Yes that is Jack on the ladders – complete with hat, making sure that the sun doesn’t reach his bald spot! It’s always fun to see your garden and the plants and flowers that grow in your climate and which I could never imagine growing where I live. The new arch/arbor looks great and really sturdy! I bet you could grow those plants where you are. I think you can grow far more things than we can, mind you I suppose your winters are harsher. I don’t think the arch will be getting uprooted by our frequent gales – fingers crossed anyway! Well, I don’t remember if I mentioned in the past that I live in the southeastern USA, Florida…to be more precise. Some of what you can grow in the summer will grow here in the winter, but our summers are too hot and humid for plants that are happy in your climate. I’ve just had to accept it and be happy with the beautiful magnolia blooms that I cut and bring inside all summer! No I don’t think you did mention you are in Florida. That means you could grow all sorts of Mediterranean plants I think. I can grow lavender easily and the bees love it, I’m sure you could grow it and of course roses would be perfect for you, I’m sure they’re natives of India or Persia. Your magnolias sound wonderful, I wonder if they’re the same as our magnolias, they only flower in the spring for a short time though. I always enjoy your garden updates. The foxgloves are gorgeous. I need an arch like yours for my honeysuckle to grow on. Right now I have a small trellis but the honeysuckle is starting to tip it over. Though that might not continue to be a problem because the honeysuckle is developing some strange black blight that is making it die off. See, this is why I will never succeed as a gardener! Ooh I hope your honeysuckle survives, it’ll probably be fine next year. It’s my clematis that always get a horrible blight just about every year – dying from the toes up! We all have our failures – and just blame the weather! NIce! I’m really looking forward to having a forever house some day and planning out some long-term gardening. 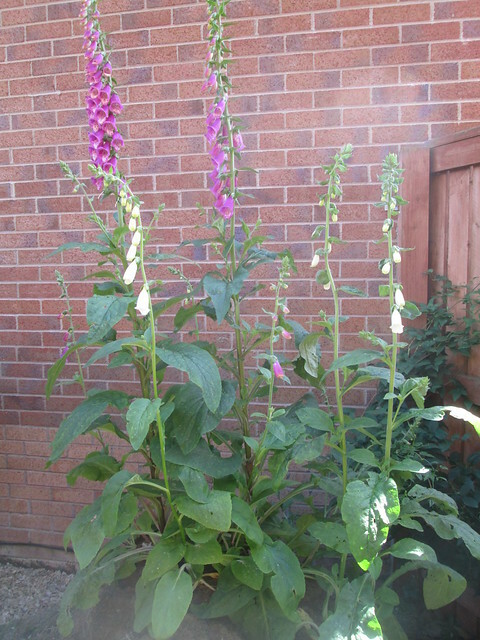 Love your plants, especially the foxgloves. I hope I end up in a climate where I can grow some myself! Make sure your forever house has a decent climate for a garden – it’s your turn to choose after following your husband around for years! We thought our previous home was our forever house, we were there for 26 years but when heating it became so expensive and it seemed that something always needed fixing at great expense we decided that when J retired we would move to a more modern home. It’s not as quirky as the Victorian one was – but it’s far more comfortable. 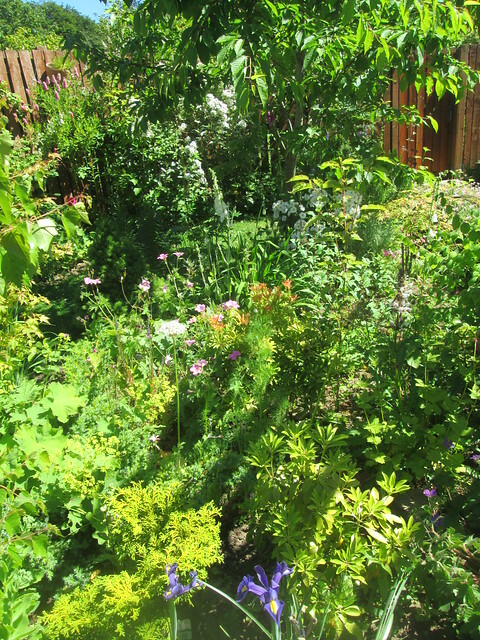 I really miss the garden that I tended for all those years though. Your garden is lovely. I like the shape and the placement of the new arch. Not only do you have great and happy plants, your garden is full of interesting hardscape. Well done! Thanks. Sadly I don’t think I can comfortably fit in much more in the way of hardscape though.